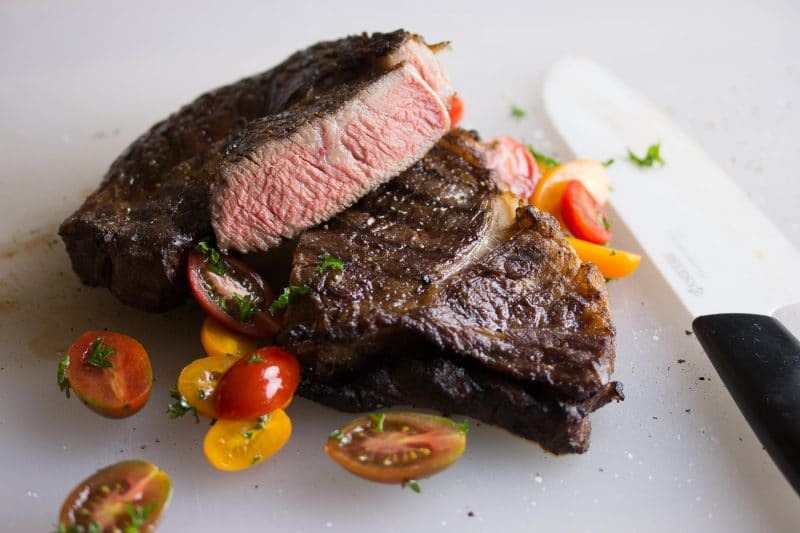 Directions for making Sous Vide steaks with tips & tricks for amazing juicy and tender steaks made with a sous vide machine. Never overcook or under-cook your steak again. If you don’t own a sous vide machine, you really should consider getting one. 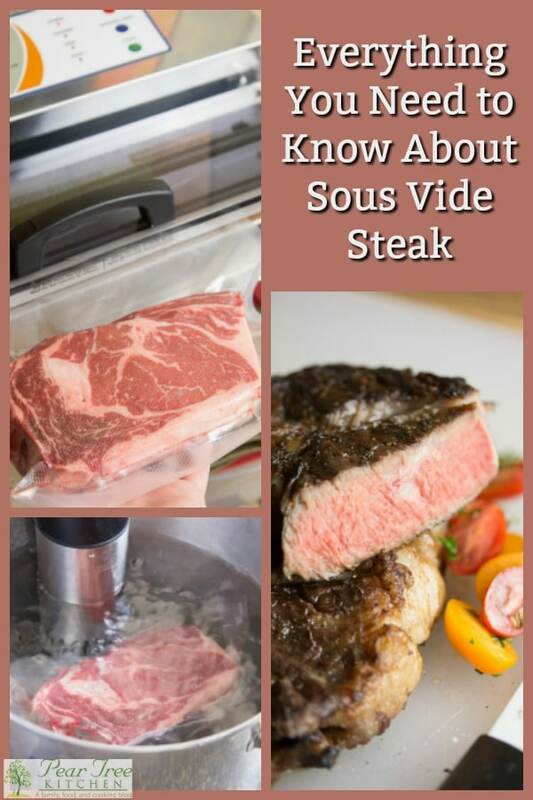 There are a few reasons you want to consider using a sous vide machine for cooking just about any kind of steak. You can also use it to make some killer baby back ribs. 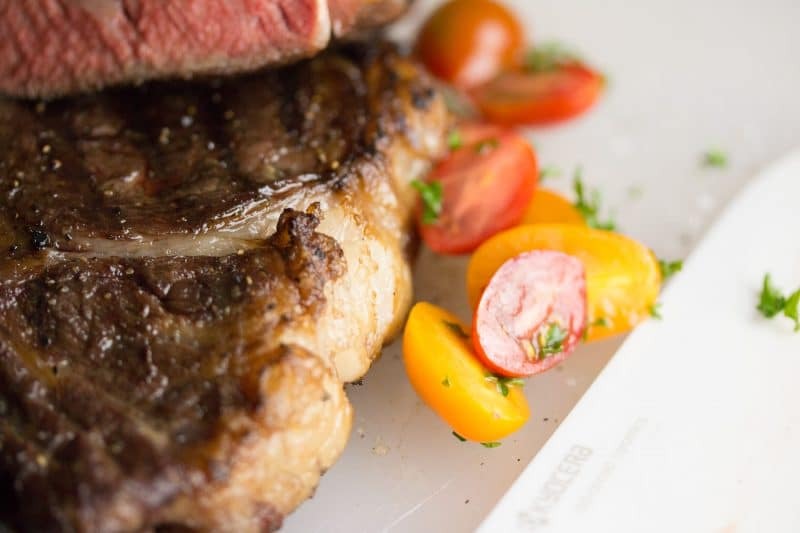 Sous vide cooking allows for a longer cook time which will help tenderize some tougher cuts of steak. 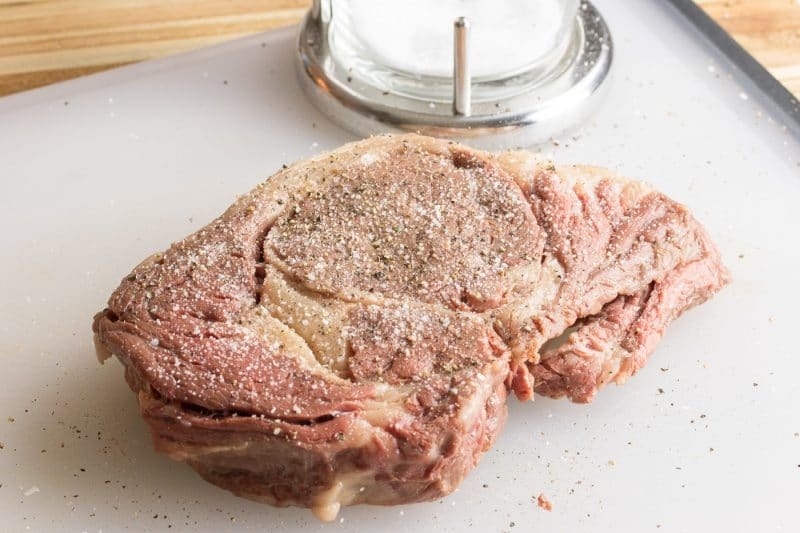 You can prepare your steaks in vacuum sealed bags well in advance of having to cook them. You can even toss them in the freezer. This is great if you ever need to cook steaks for more than a handful of people. 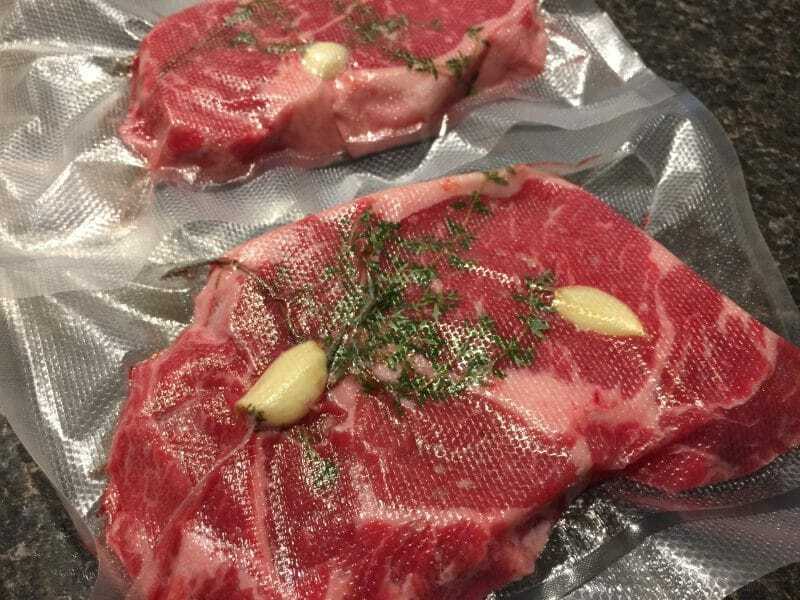 If you vacuum seal your steaks (you can use ziplock baggies. I’ll talk about this in a bit), you can go ahead and prepare your steaks in bulk. So you can buy steaks while they are on sale or even buy whole sides of beef and have them cut to your liking. This can help you save money on steak nights. 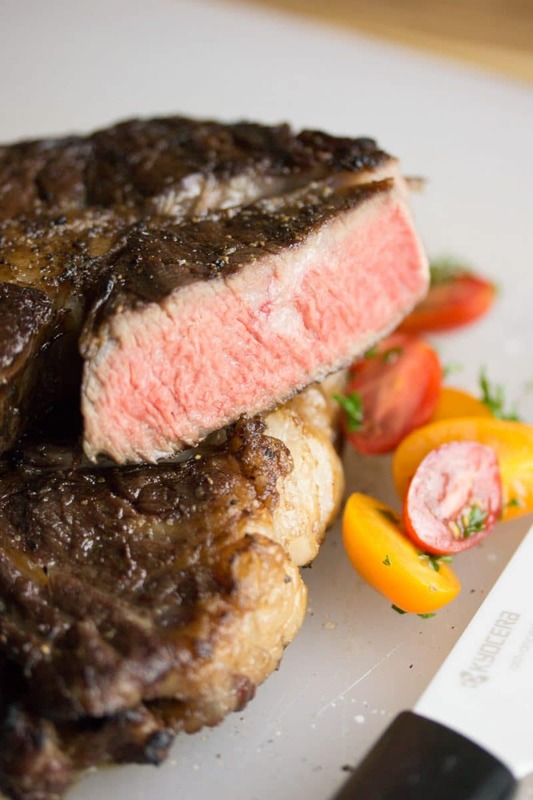 Cooking sous vide steaks is super easy, a sous vide cooker truly simplifies steak perfection. All your food snobby friends will think you’re super cool. What is a Sous Vide Machine? So at this point, if you haven’t figured it out, you’re probably wondering what a sous vide machine is. A sous vide machine is pretty much a temperature controlled heating element that is used to keep a water bath at a very specific temperature. You set the sous vide machine to the desired internal temperature of your meat. You place your meat in the sous vide machine for a specific amount of time and it will cook your meat to your desired temperature. After your meat has been sous vide, you can either eat as is, or go through a finishing step, like searing the outside. So, let’s get into what you’ll need. The first thing you’ll need is a pot or container large enough to contain your sous vide machine and the amount of food you want to cook. 2-gallon pot for 1-6 steaks. I could probably squeeze 8 steaks in there, but getting pretty dang crowded. I bump up to a 5-gallon pot for any more than 8 steaks and that’s usually large enough for the largest gathering. Anything larger than this and a typical tabletop sous vide machine will have a hard time maintaining temperature. The second thing you’ll need is a sous vide machine. I have an Anova unit. Just look on Amazon for one with good reviews and can output at least 800 watts of power. Ignore all the Bluetooth stuff and other gadgets. You just need a sous vide machine to heat water. If you don’t feel like buying a sous vide machine, you can try going a manual route and using a large pot on your stove. You can use a thermometer to keep an eye on your temperatures, but it’s really hard to maintain and keep a temperature this route. It will get you there, but going the manual route is just a lot of work. If you want to go sous vide without a machine and you have a medium sized cooler, you can heat your water above (10 – 15 degrees) your desired temperature, and pour your water into the cooler. Let your water rest for a few minutes and see what your temperature is. You want to overshoot your temperature a little bit. It’s easier to let water in your cooler cool than it is to have to transfer it back into the pot and heat it back up. This is a procedure you’ll have to experiment with. This also has an enhanced danger as you have to pour hot water from one vessel to another, which can be dangerous. Next, you’ll need some kind of bag to stick your meat in. This can be as simple as ziplock freezer baggies. You want something heavy duty. I have found that cheap thin ziplock baggies will let water in or let juices leak out, so get something heavy duty. My favorite bags are vacuum sealed bags. I purchased a beefy vacuum sealer so I can take advantage of cheap cuts and buying in bulk. 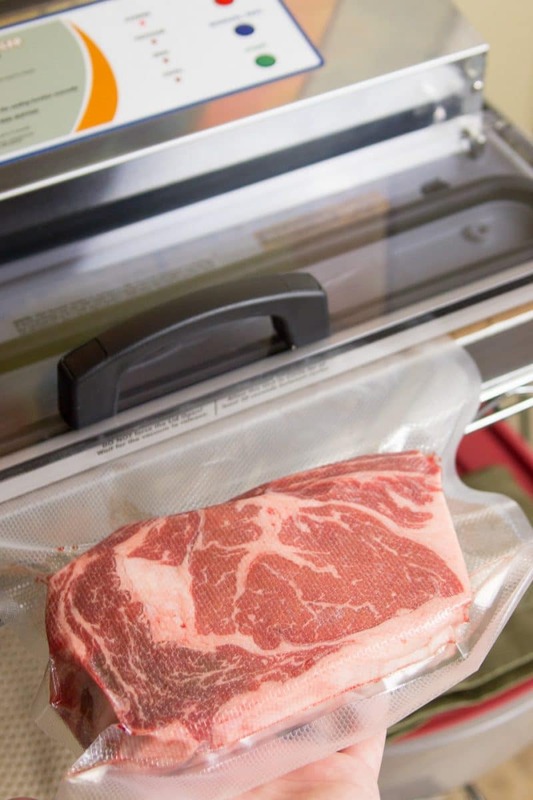 So this might be a good excuse to buy that vacuum sealer you’ve always wanted. The final thing you’ll need is a way to finish off your meat. 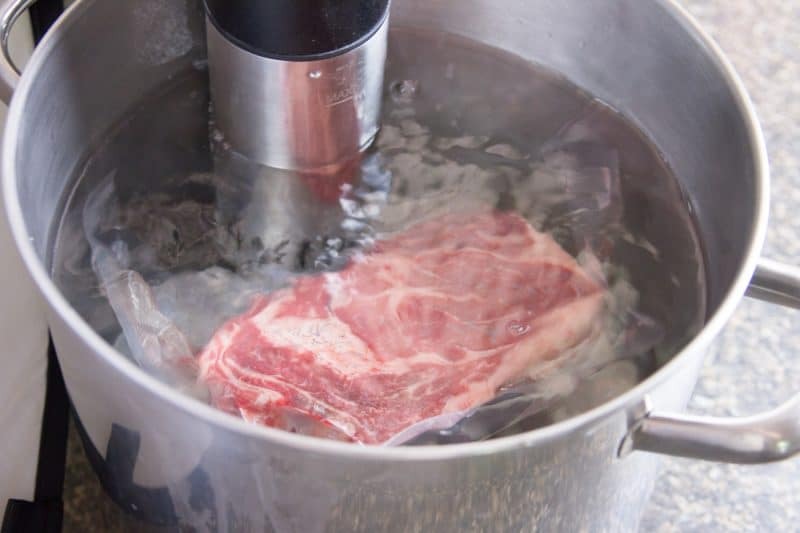 Almost all forms of sous vide cooking will require the meat to be seared or finished in some way. For this blog post, steaks will need to be seared after being sous vide. For me, I just use a cast iron skillet. A very hot charcoal grill is amazing too. I have even been known to use a blow torch (seriously). Once you have all your stuff, you’re ready to start sous vide cooking everything you can think of. 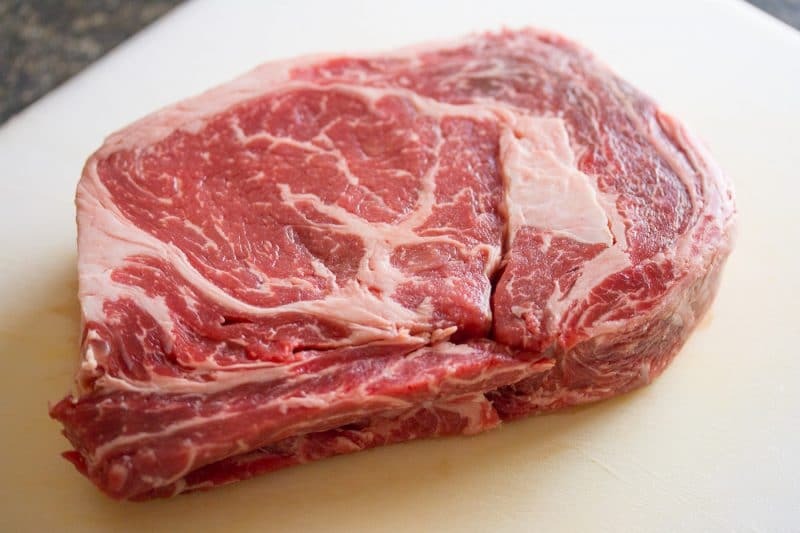 For steaks, I highly recommend ribeyes or strip steaks. Just about any cut off steak will work very well here. Hell, people sous vide entire cuts of brisket. It takes 24-48, but it can be done, but that’s outside the scope of this blog post. So run to the store and get yourself some supplies. So now that you have you’re gear, you’re probably curious about what temperature you should set your sous vide machines to and how long you should cook it. Set your sous vide machine to your desired doneness temperature. These temperatures are rough estimates. Every machine is a little different and I’m guessing their thermometers aren’t super accurate. However, 132º F is my absolute favorite. You can sous vide a steak from anywhere from 1-3 hours. I like to sous vide mine for 3 hours. You’ll notice I don’t salt my meat before vacuum sealing it in the step below. I do this because I often like to make a bunch of vacuum sealed steaks at once. I’m not sure how salt will do longterm on frozen meat, so to be consistent with how I cook, I choose to just go forward with salting afterward. Feel free to salt before you sous vide if you’d like. So here are my basic steps for sous viding a steak. 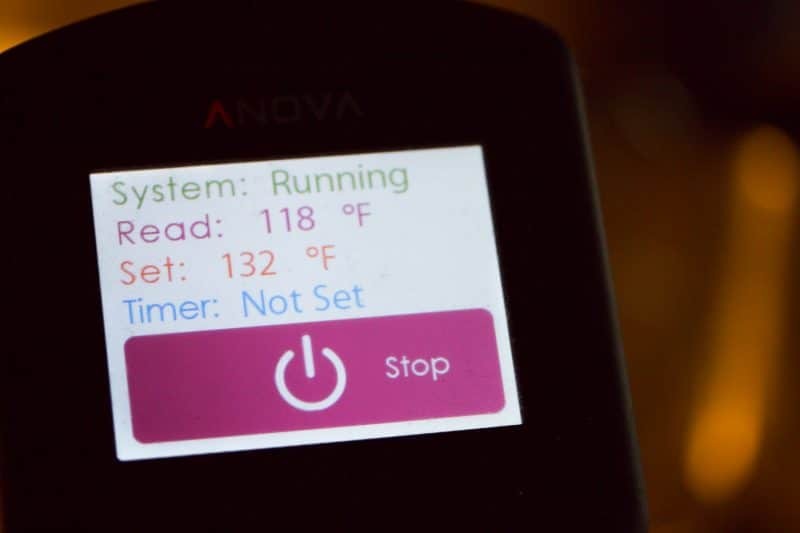 Preheat your sous vide setup to your desired temperature. Place your meat in a ziplock or vacuum bag. Add your optional ingredients (pepper, garlic, thyme) – I typically leave the salt out here. For this post, I didn’t add anything out of simplicity. I’m going to let the meat do the talking. Seal the bag almost all the way closed and evacuate the air and seal closed. Place your steak in the hot water. TIP: If you’re using ziplock baggies, I recommend using a binder clip to hold the Ziploc portion of the bag up and out of the water. Just clip it to the edge of your container. Walk away. Just ignore it for 1-3 hours. Remove the steak from the water and bag. Pat steak completely dry and toss any herbs or seasonings you may have added. Preheat your grill or cast iron pan to as hot as it can possibly withstand. 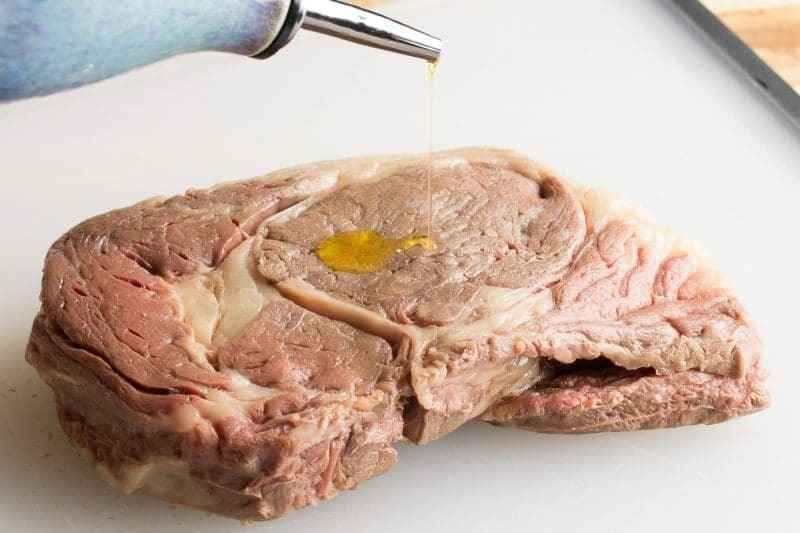 Oil the outside of your steak with olive oil. Liberally season your steak with salt. 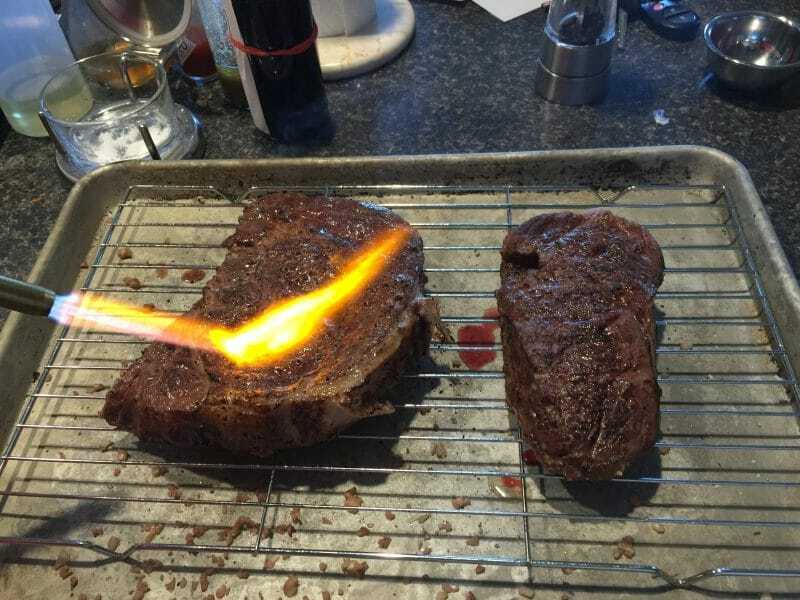 Place steaks on a hot cooking surface. Sear both sides of the steak for about a minute. Might be less if you were able to get your grill or pan super hot. You want a nice golden crispy outside. 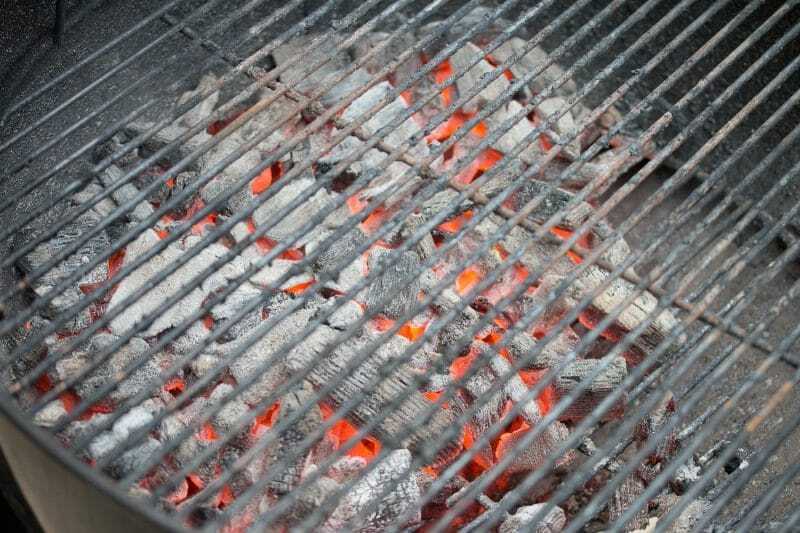 If you’re doing this on a grill, be careful with flames that might flare up. 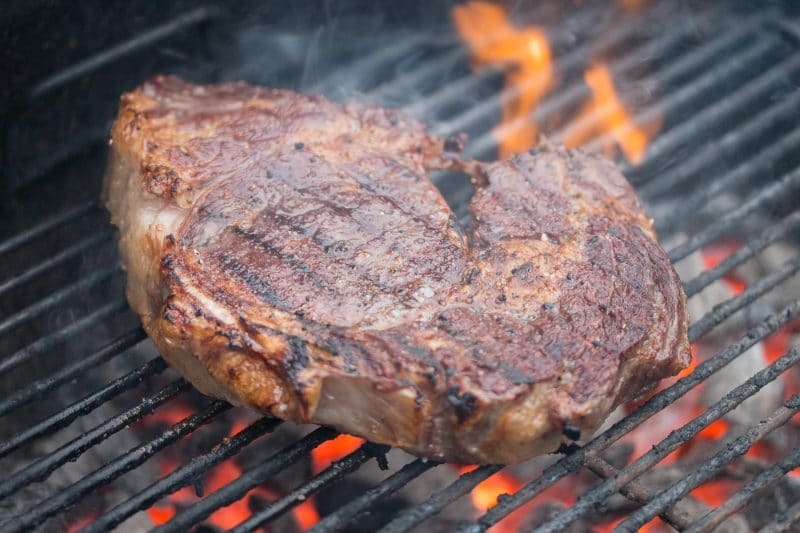 Take the steak off the grill or out of the pan. The final step, enjoy your perfectly cooked steak. *Our posts contain affiliate links. If you buy something through one of those links, it won’t cost you anything extra, but we will make a small commission which helps keep our pantries full and allows us to continue to test sous vide techniques and recipes in our kitchens. These are the tools I use in my kitchen for Sous Vide Cooking. Anova Sous Vide Cooker, this one has Bluetooth, but as I discussed, Bluetooth is not necessary. Electric Vacuum Sealer, this is good for more than sous vide cooking. We use it for buying meat and produce in bulk and freezing in individual packs. If you enjoyed this article and would like to see more Sous Vide recipes, let us a comment and tell us what you would like to see cooked with a Sous Vide Machine. We are always open to suggestions. Don’t forget to follow us on social media and sign up for email notifications whenever new articles and recipes are posted. Hello! Thanks for visiting! I am going to go out on a limb here and assume (I know the joke about assume) that those bags are food safe and would be fine for sous vide cooking. The only thing you will be missing is the chance to flavor the meat all the way through during the slow cooking process. I would check the steaks during the first hour to make sure there are no leaks. Check back in and let us know how it works out. some steaks are sold in vacumn sealed bags. can u just drop them in as is no prep? That looks FANTASTIC! I have got to get me one of those. Great pictures!